I'm flying to Nashville 3/4/17 to start Western Express Flatbed. I have driven local and have about 23 years experience in beverage industry from 1983 to 2007. I realize I am considered a newbie due to 10 year lapse of no driving and will be refresher. As I begin my journey with Western Express will share my experience and what I learn with all on TT. Both you and Brett with a few other professionals here make TT the best board second to none for solid, accurate information on the trucking Industry. I know a few here are affiliated with Western Express Flatbed. Do they have heavy Haul or Specialized division ? Any information greatly appreciated. I sometimes think it's a universal problem in this career that there just seems to be a lot of naysayers, but I don't think your success or failure lies in the name of the company that's on the doors of your truck, but rather it's bound up in your willingness and ability to not only cope with the difficulties of the job, but to succeed at overcoming the odds against you - and that includes overcoming the prevalent attitudes and ideas which are mostly based on false premises to begin with. Very well said! I agree 100%. Old School, every time you say something I think, "OMG we have to make sure everyone sees this. Where can I put it????" One of these days you might login to the site and find your quotes in place of our header image at the top. I just booked my flight to Nashville TN 3/4/17 to start orientation with Western Express and looking forward to getting started ... Although I have 23 years driving experience I have been self employed in a unrelated industry for last 10 years. Like to thank all for the great advise and words of wisdom !!! Will touch base here when I can to keep all informed on my progress and thoughts. Yeah, this is one of the most dangerous ideas I've seen in a long time. We're going to have trucks start tailgating each other to save a single digit percentage on fuel? Seriously? And we're going to rely on technology to 'keep us safe'? Cuz, you know, technology never fails us, right? To me this idea is dumb beyond words. The risk/reward ratio is ludicrous. I'm sure this idea managed to get some funding for a few college professors to continue their research on aerodynamics, but in the real world this idea is nowhere near making any sort of sense. 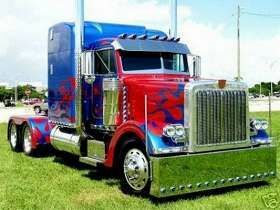 I agree 100 % that this tailgating or wind drafting may work well in NASCAR racing but using this to save fuel by adding 1/10 mpg with big rigs is insane. Having trouble with pre hires and speeding tickets. I am new here and had a similar issue. Drove from 1983-2007. Have been self employed in unrelated industry and looking to get back into OTR flatbed. I recieved 1 speeder in 20 years in my personal vehicle that was 15 plus over the posted limit in PA. I applied to many and turned down until ticket is 1 year old or in some cases 3 years. The problem is I have 2 speeding tickets. One in February of 2013 for 21 over and one in August 2013 for 15 over. No accidents, no criminal, only 2 employers in last 15 years. AM I wasting my time getting my CDL since I have the speeding on my record? Any suggestions on company's that will hire me? Obviously want to flatbed from my choices above. The High Road Training Program is AWESOME!! Helped me tremendously in passing my permit tests the first time.